Fighting crime in Gotham City just isn't as easy as you might expect. It's full of crazy characters who concoct wildly intricate schemes to poison the water supply while choosing monikers by heading to the zoo and finding which animal is the main exhibit for the day (we're looking at you Mr. Oswald Cobblepot)! The fact of the matter is, you're just not safe revealing your true identity while fighting these sorts of villains. What would the Penguin do to Wayne Enterprises if he knew that Bruce Wayne was the one toppling his plans for criminal activities at every corner? Villains would be showing up at Wayne Manor every night to play a game of ding-dong ditch with Alfred and he doesn't really deserve that. For all those reasons, Batman wears a mask and if you plan on dressing up like Batman, you should too! 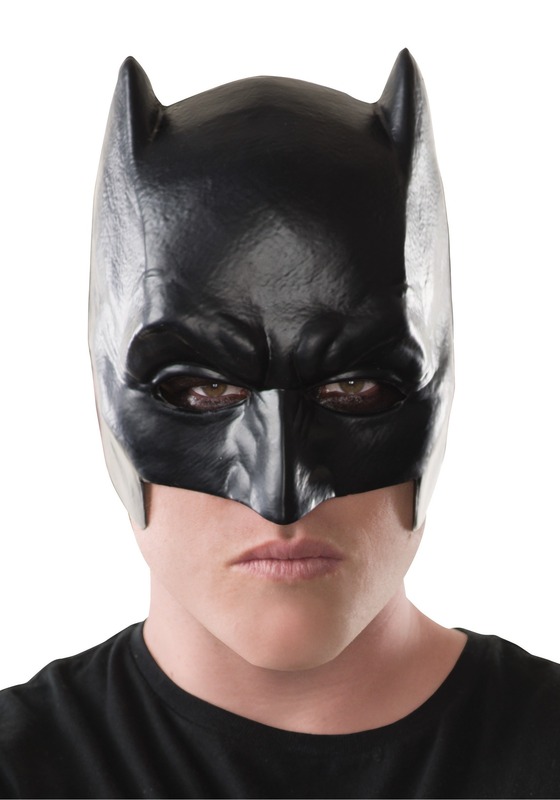 This Dawn of Justice Batman Mask is an affordable choice for your identity protection needs! The licensed mask comes from the Batman v. Superman movie and hides your face, so you can battle against any villain without them wising up to your real identity. Since it's molded into the shape of the one in the movie, you get to look just like the Bat-fleck's portrayal of the DC just by slipping it onto your face with the included plastic band. Of course, it won't make you give you any super sleuth powers and it won't help you throw Batarangs any better, so if you plan on doing some serious crime fighting in your city while wearing it, you'd better brush up on your crime-fighting skills!